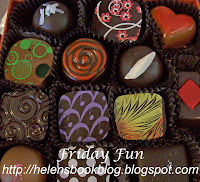 Helen's Book Blog: Friday Fun: Christmas loot! Street Names of Santa Barbara--it gives the history of many of our streets, which is kinda' cool. The Ultimate Book Club Organizer. Actually, I got 2 of these since I am in 2 book groups :-) For both I am the "secretary" and I don't do a good job of keeping track of what we've read so this will surely help. I hope you and yours have had a wonderful Christmas filled with love, laughter, family, fun, and books. Oh wow Helen - look at the great books! I am going to have to go on line and check out that book club organizer! I have the Shanghai Girls, too, so we'll have to chat about it when we read it! Merry Christmas!